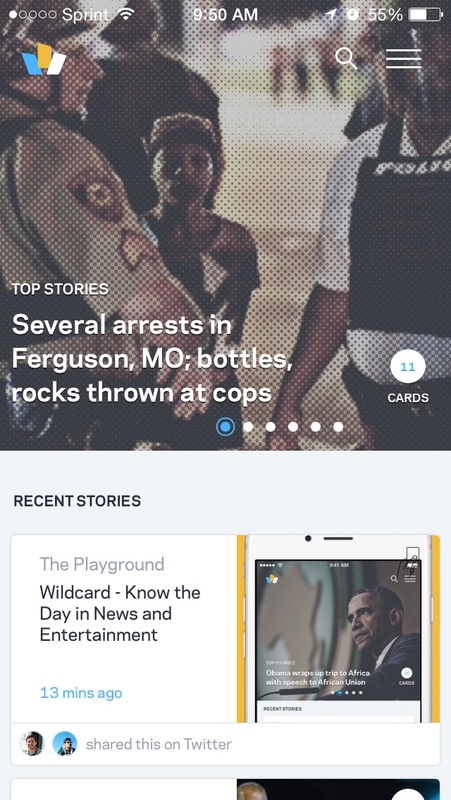 After 7 months of incredibly hard work, we launched a brand new app today. My blood, sweat, and near-tears are baked into this product…and I think that’s exactly what it takes to create a best in class experience on the iPhone. Wildcard 2.0 is not a proof of concept. It’s not a technology demonstration. It’s not a new design language. As of 7AM this morning, it’s the best news and entertainment app in the Appstore. It’s complete, it’s premium, it will keep you up to date throughout your day, similar to a Twitter or Facebook, but it’s beautifully designed and editorially curated to surface the highest quality content from the web, without the noise and junk. It’s on my home screen, and it would be there even if I didn’t help to build it…and it’s on a lot of other home screens…thanks to an incredible group of beta testers who helped us refine and perfect it over the past 2 months…people use it everyday…it’s become a part of my life, a part of an extraordinarily high percentage of our beta users’ lives, and today I hope it becomes a part of your life too. It’s absolutely beautiful, absolutely smart, so easy to use, and you can count on it to keep you informed and entertained weather you have 2 minutes waiting in line for lunch, or 2 hours stuck in traffic on the Long Island Expressway. I know you probably have some other way that you are used to getting your news and entertainment every day…but Wildcard 2.0 is next level. When we started Wildcard, we set out to redefine how you access and consume the web’s content from your phone, and today I think we’ve answered the news and entertainment portion of that question. We are going to work our asses off, day and night, to ensure that you know what’s happening in the world, and in your world, everyday. You’ll know the 10 major things that everyone at work is talking about, and the next 20 things that are super interesting but didn’t make it into your Facebook newsfeed, and finally the 20 things that are important news to you, but not necessarily to the rest of the world…in short…with Wildcard 2.0…you will Know the Day. Enjoy, and please let us know what you think. We’re @wildcard on Twitter. Lastly, so many people here worked tirelessly to bring 2.0 to life. I’m so proud and appreciative of our team here at Wildcard…it’s a really wonderful group. P.S. Here’s a little coverage from Techcrunch, The Next Web, and some Q&A on Product Hunt that goes a little deeper on the new Wildcard app. Hi Mario. Wildcard is in most countries right now, but not yet Germany. We will work to get there, but there are some local copyright laws we need to better understand before doing so.